One of the leading ladies of Bollywood, Alia Bhatt turns a year older today. On the occasion, the actress has taken to her social media handles to announce that she has received the best birthday gift ever from her mother Soni Razan. 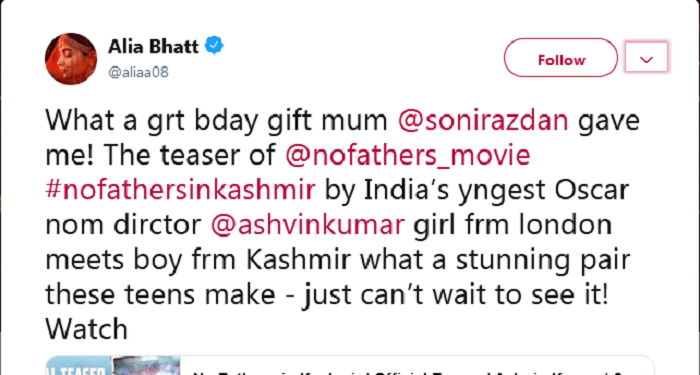 The teaser of Soni Razdan's upcoming film 'No Fathers in Kashmir' has been unveiled today and Alia Bhatt has shared the official teaser through her social media handles. After an eight-month battle with the Central Board of Film Certification, Oscar-nominated director Ashvin Kumar's 'No Fathers in Kashmir' is all set to release on April 5 this year. The teaser of the film presents an intense drama set in the valleys of Kashmir. Sharing the teaser, Alia Bhatt captioned, "What a grt bday gift mum @sonirazdan gave me! The teaser of @nofathers_movie #nofathersinkashmir by India’s yngest Oscar nom dirctor @ashvinkumar girl frm london meets boy frm Kashmir what a stunning pair these teens make - just can’t wait to see it! The 'Kalank' star has been supporting the film on her social media while it was having troubles with the Censor Board for certification. She had even requested the CBFC to release the film. Earlier this month, the Film Certification Appellate Tribunal (FCAT) had suggested that 'No Fathers In Kashmir' is fit for a U/A certificate after a few cuts and disclaimers are incorporated in the movie. The film traces the story of a British-Kashmiri teenager Noor, who is in search of her father. In the journey she befriends Majid, who helps her in her mission. The two develop an innocent love story as they find themselves in the midst of the darkest secrets of the valley. Besides being its writer and director, Ashvin also stars in the film along with Soni Razdan,Kulbhushan Kharbanda, Anshuman Jha and Maya Sarao. The film is set to hit the screens on April 5.